This is what I was going for. Simple, no? Let's compare it to the sloper: no waist darts, bust dart moved into underarm position, deep neckline, slight A-line - a bit of flare at the hemline. Step 1: trace the front sloper. Mark the new position of the bust dart - Point A is 6 cm down from the top of side seam. Step 2: draw new shoulder seam. B to B1 (distance from neck) is 4.5 cm; B1 to C1 (new shoulder width) is 5 cm. 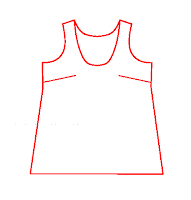 Also draw the new neckline (I chose a deep neckline, 13.5 cm down from center neck - point D1). Trace down along the center line to waist line. Step 3: to close the bust dart, and move it to the new position, overlay the sloper, mark point A as well as points 1 and 2 (click on picture below for a better view). Place a pin in the tip of the dart. Step 4: rotate clockwise around the tip of the dart (or bust point - BP) until point 2 on the sloper matches point 1 on the paper under. 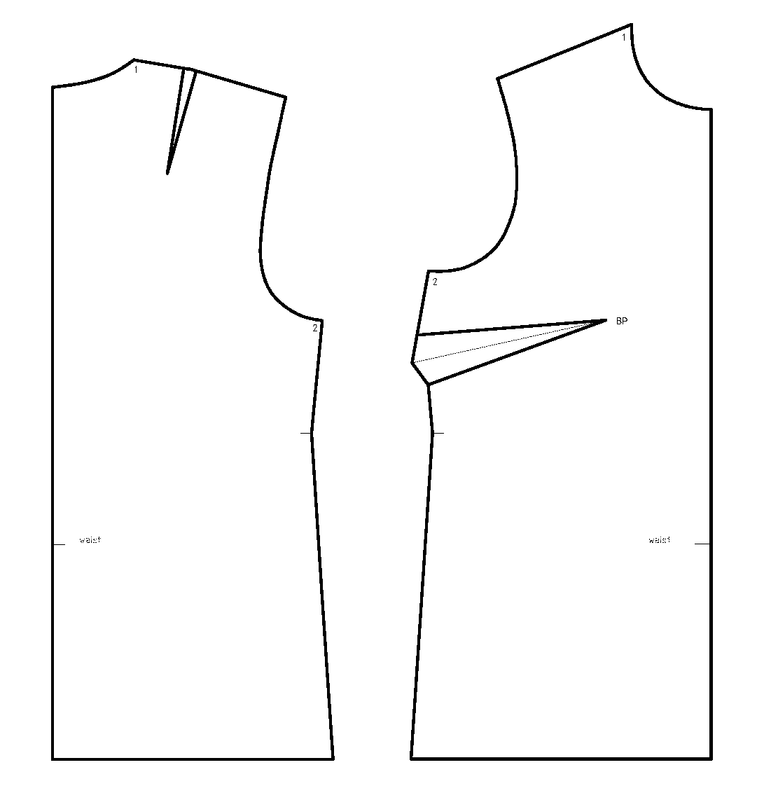 Trace along the sloper from A along side seam and arm opening to point 2. Step 5: this is what you have at this point. A1 is the new position of A after rotation. Connect A1 to BP, and A to BP - and you have the new dart! Step 6: draw the new arm opening. Step 7: OK, one more step I have not mentioned in the intro... Since I made a deep neck opening, I need to tighten it a bit, to make it lay flat. If you decided on a smaller neck opening - you can skip this step (go to step 9). Draw a line straight down from B and across from D1. 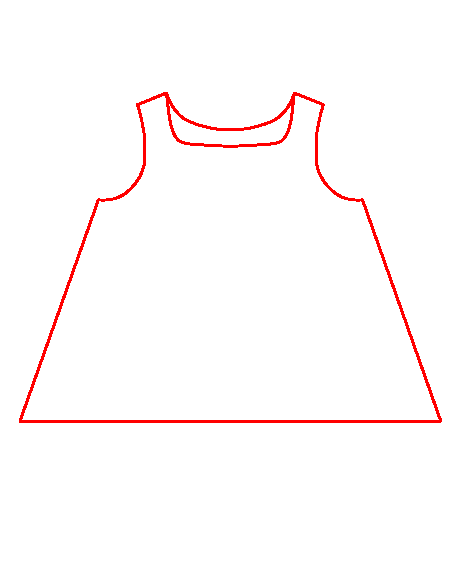 Then draw a line from BP through the intersection of the lines drawn (from B and D1) all the way to the neckline (E). E1 is about 0.5 cm away from E on the neckline. Draw a line from E1 to BP. To tighten the neckline, we need to close this little "dart" we draw between BP, E and E1. (Ignore points 3 and 4). Step 8: you can skip this one too if you didn't have to tighten the neckline (go to step 9). Cut the outline you have now (don't worry about the dart, just cut straight from A to A1), then cut the BP-E-E1 "dart". To tighten the neckline, we now have to get rid of that little "dart" we drew in the previous step. As with any other bust dart, we need to move it somewhere. We could move it to the new bust dart, this making it wider, or we could move it into the waist widening at the hem. I chose to do the latter - the bust dart is already wide enough, I was afraid that if I make it any wider, I will create a very "pointy" bust. So, cut from BP straight down to WL (waist line). Then rotate around BP clockwise until E meets E1. This will open up a dart on the waistline. This one will be blended into the design, making a slight A-line. Trace around the paper. And here is where I got stuck... a little bit. I wanted to compare the pattern I got, to the BurdaStyle pattern that was the starting point (scroll to the top). Ignoring the neck and arm opening curves or the width at hem (not so important), I noticed that my dart is about 50% wider (distance between A and B) than the one in the original pattern. What does that mean? So what would it look like if the dart is narrower? What about if there is not dart? I don't know, but I will find out. That's why this is Version 1. Version 2 and 3 coming up tomorrow. In Version 2 I want to have a narrower, smaller dart. How will I get that? I definitely need to change something because I cannot just make it smaller, a dart or a part of a dart cannot just disappear, it needs to be moved.... More about it tomorrow. Step 10: take in the side seam by 1 cm. Learning from Week 1 pattern, I am expecting this one to be a little wide under arm - so I will take the side seam in by 1 cm. To do this, simply fold the dart and draw in a new side seam. Then open the dart, add in the new lines for the dart and cut off. That's it.